This is the fourth post of our series of projects to make us thankful for DIY. Be sure to check back everyday during the month of November for new simple and easy DIY projects. If you're like us, then you have limited space in the living room. We've got couches, chairs, tables and the odd toy laying on the floor to stub your toe on. Before you know it you're out of room, (and in pain). We're always trying our best to keep it neat and organized but still have room to move. If you have a small space or live in an apartment, here is a great idea that is easy on space and your pocket book. It only takes up the space on the arm of your couch, (or sofa depending on what part of the country you're from). And you'll still have room for those toys to stub your toes on...YEAH. While we're relaxing we'll put a drink on the floor cause you know...space. Next thing you know, the drink has been knocked over...cause you know, kids. Having one of these would be so handy. All you have to do is get comfortable with a drink or TV dinner and you're good to go. 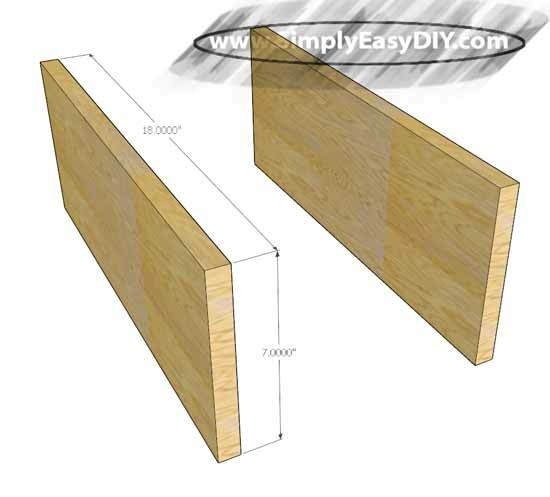 2 Side Pieces @ .75" x 18" x 7"
1 Top Piece @ .75" x 18" x 10.5"
NOTE: The above listed measurements are for our couch here at Simply Easy DIY. Obviously couches come in all sorts of shapes and sizes. 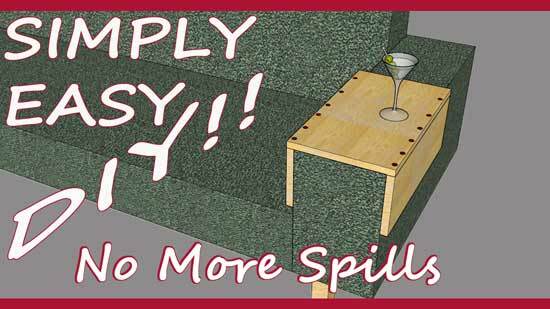 You will need to measure from the top of your sofa arm to the top of the seat cushion to get the depth of the side pieces. For the width of the top piece you will need to measure from the outside of your sofa arm to the inside and then subtract an inch and a half or so to account for the thickness of the padding. This is so the tray will fit snugly around the arm of your sofa without it being loose and tipsy prone. Cut the two side pieces. NOTE: Read the NOTE above! Cut the top piece to size and if you want, you can measure and mark for the dowel holes now instead of trying to do it after we have applied the ninety degree clamps in the next step. Apply some glue to the adjoining pieces. Then apply a few ninety degree clamps to each of the four adjoining corners and finish drilling the dowel holes to the desired depth. 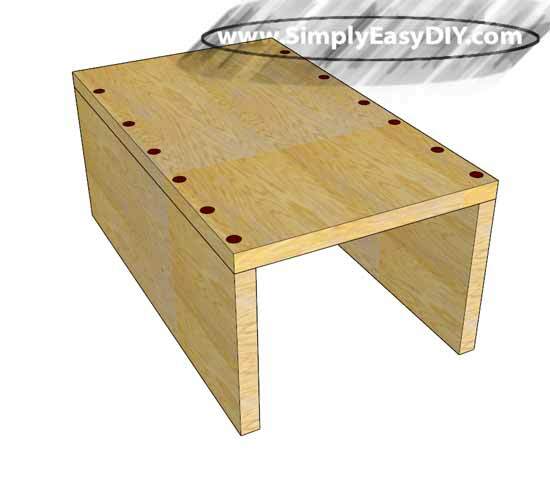 Then all you have to do is fill each hole with a dab of wood glue and hammer home some 1/4" dowels. 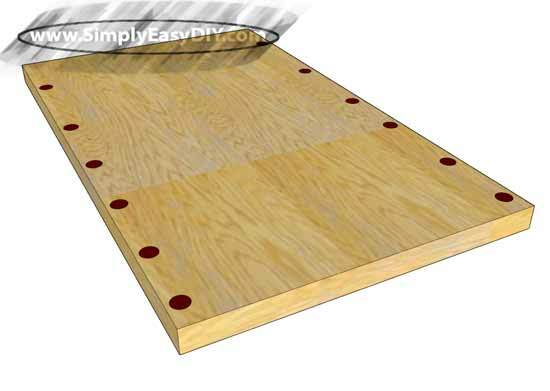 After that a flush cut saw, or pull saw as they are sometimes called, can be used to cut the tops of the dowel rods flush with the top of the sofa tray. After a little sanding and a few coats of your choice of stain and/or sealant such as some satin polyurethane... ENJOY! 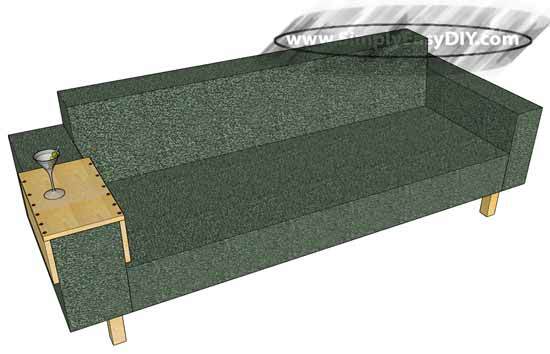 NOTE: Obviously the couch pictured here is just my crude attempt in my CAD drawing program to represent a couch. I don't actually expect sofa arms to be square...DUH!!! The video below is from a YouTube creator called Mark Susak. Check it out and if you like what you see be sure to stop by his channel and subscribe. Tell him Simply Easy DIY sent you. Obviously there will be some slight differences in assembly techniques used but hey, that's what makes the world go around. A simple creation that can be built in a day with supplies that you already have in the shop. A bit of extra material might score you a few more to build and give as gifts. Now you just have to keep your pet out of your drink, hehe! I hope you enjoyed today's featured project and don't forget to stop by "Mark Craft Woodworking" YouTube channel to check out even more great videos from Mark.